Jack Griffiths may be one of the younger RFUK members, but he sure has the enthusiasm that comes with being a veteran reptiles keeper. At only 15 years old, Jack already has a Californian Kingsnake, a Pastel Royal python, and a Florida Flame x Orange Bearded Snake. Unfortunately, the problems he faces with keeping these reptiles are not just how to take care of them. Some of the problems are ones that come with his age. In other words, his parents always have a say. "To be completely honest, my main struggle in keeping Reptiles was persuading my parents to allow me to be able to keep them. When I wanted to purchase my first snake (the Cali king), my dad did not like snakes at all and was 'scared' of them," he said. Keeping a Californian king and a Pastel Royal did have some other problems as well, including struggling with temperatures, getting the snakes to eat properly and feeding them properly, as well as making them shed. But Jack handled it in stride, with help from the forums of course. After also obtaining a Bearded dragon, he is now in the process of convincing his parents to let him own a Common Boa Constrictor. 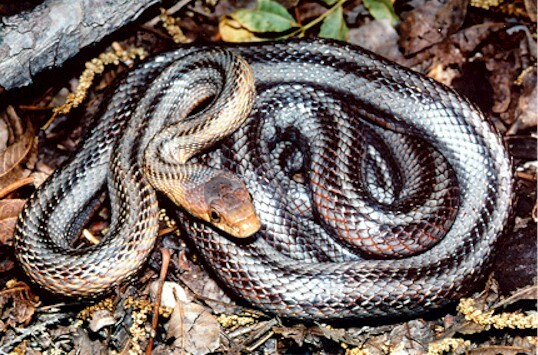 "In my opinion, its one of the most beautiful animals in the reptile species," he says. Sabra Chapman is fun and cute and bubbly. The kind of young work professional who's in her late twenties and hangs out at the pub after hours. Still, there's one key characteristic that makes her truly unique. Sabra keeps snakes. She just started self-proclaimed "obsession" but she feels telling her story is a great way to connect to other young people who might be in the same position. "From a young age, I'd had an interest in the 'unusual', I remember finding a newt as a small girl and keeping it for awhile. It had a little pool and plants in a make shift viv. I took it to school for show n tell and was asked by the teacher if i would donate to the nature reserve at the school. I remember being really annoyed I'd lost my pet! Mum said I also had a tendency to catch bee's and snails! I never seemed content with budgies, guinea pigs or cats!" she says. As she got older, Sabra met a few friends who kept lizards. It wasn't until she met friend Chris, however, that things really started to change! Mike Hobson may be new to the reptile world, but he sure doesn't show it. He's known he'd be keeping reptiles in his home since he was a child and now that he has them, you can call him something of an expert. Although he would never admit it, he knows what he's doing. It all started on December 30, 2009 when his partner told him that all the birthday presents she wanted to get him online were out of stock. With £100 in her pocket, she asked him, "What do you want?" Being the expert he was, Mike, without thinking, quipped, "A snake." "With that I went online and did a load of reading (my eyes where hurting afterwards lol) and the snakes i read about where corns and royals," Mike says. The next day he went with his partner online and found a normal 18month old female royal, a large vivarium, lights, and more. The asking price was , £120 but Mike bargained it down when he noticed she had retained shed on her head and upper neck. "So i said 'I have £90 and I'll take her now.' So home i went with my 1st rep."
Sounds like a movie huh? We have a very special member spotlight on the horizon. We have another Andy in our midst (apparently you RFUK members like that name, I've already encountered three of you) but this one's a MODERATOR! His name on the forums is Bothrops. Andy Wootton has been on the RFUK forums for almost three years now and was recently invited to become a moderator. He's still not sure what he did to deserve it, but we have a few ideas swimming around. Want to know why? You'll have to read the rest of this spotlight! Andy grew up surrounded by cats, dogs, and rabbits and early on in his existence, he attempted to persuade his parents for a snake. They wouldn't allow him to keep one for excellent reasons (he was 5 years old at the time and his mother had a fear of them!) but he continued to persist until the ripe ol' age of 9 when he brought in stick insects, European tree frogs, and green anoles. Still no snake. By age 12, his mother changed her tune to, "I'll think about it and the next day he was the proud new owner of a yearling classic corn snake. Thus, a snake affinity was born.